These are what we might call regional brands. Osborne were made by a Portsmouth company, The Osborne Tobacco Co Ltd, while Ward's Own hailed from Sunderland. Murray's were from Belfast, ...a superior cigarette with a rich aroma. 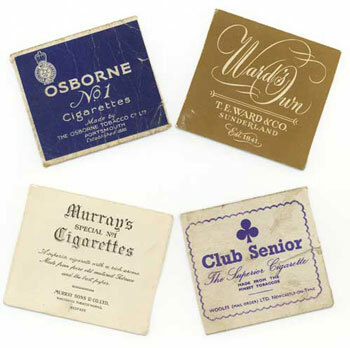 Made from pure old matured tobacco and the best paper.... .The Club Senior packet states they are from Woolf's (Mail Order) Ltd. Newcastle-on-Tyne and made from the finest tobaccos.